PBJacquemin .com. Optical Tracking - Laser Illuminated Optical Tracking and Pointing of Targets or Tissue for Medical Treatment. The objective of distant target tracking and free-space laser communications relay ATP (Acquisition, Tracking and Pointing) is to provide missile target tracking and laser based communications links in high disturbance vibration and harsh operational environments. The challenges are to stabilize a high energy illuminator laser onto distant targets, reduce wavefront error with adaptive optics, minimize target LOS (Line-of-Sight) tracking jitter error, and operate under large platform movement and disturbance vibrations. In the case of missile target tracking and large platform disturbances the WFOV (Wide Field-of-View) optics provides a high probability of target acquisition from a radar sensor target track handover. The LOS and beam forming feedback controllers optimize SNR (Signal-to-Noise Ratio) for maximum operational range. Beam forming optics compensates for atmospheric turbulence and optical scattering along the beam path. 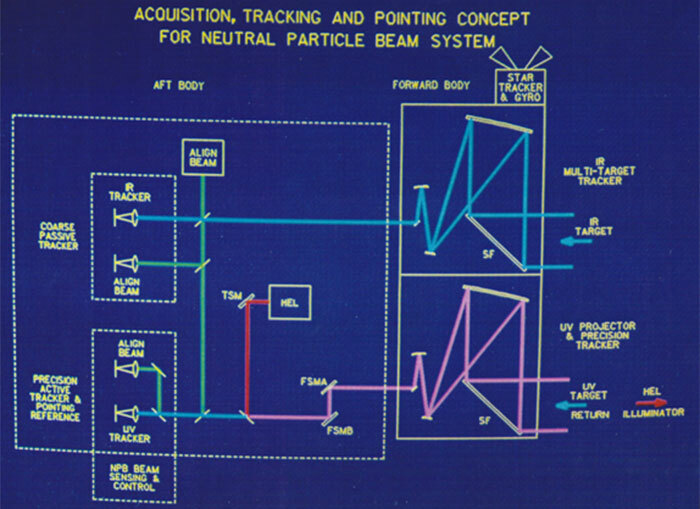 A simplified electro-optical layout of a space based target tracking telescope that provides target vector handover to a Neutral Particle Beam (NPB) discriminator. Infrared (IR) targets are passively tracked as a Line-of-Sight (LOS) vector and alignment relay hands over the target to the precision active tracker with High Energy Laser (HEL) to illuminate the distant target. The Fast Steering Mirrors (FSMs) stabilize the target image on the tracker camera. The forward body is 6-DOF vibration isolated from the aft body with a magnetic suspension. The forward body has IR and UV beam expanders with Steering Flat (SF) mirrors to extend the FOV to �5�. The forward body is intertially referenced with a star tracker and gyro rate sensor. The precision nano-radian tracker hands over the target state vectors to the NPB for LOS pointing to the target. 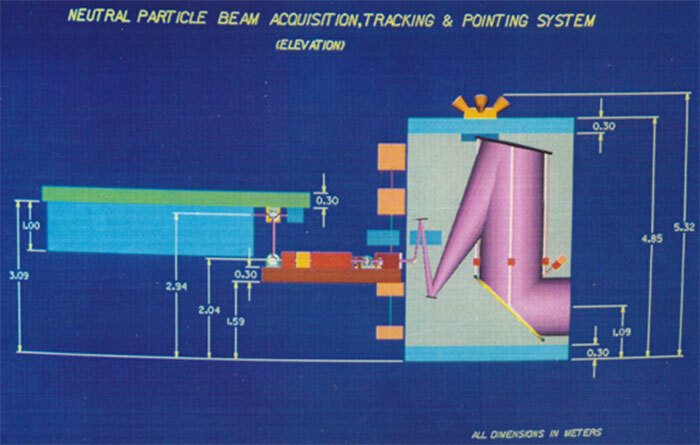 The elevation diagram shows the relative size of the forward body to aft body with a large 1x1x5 m illuminator laser in light blue next to the optics table containing the relay optics, fast steering mirrors, alignment beam cameras, and tracker cameras. The isometric drawing shows the layout and orientation for the complete target ATP system. Miniaturization of this design for medical applications is achievable using fiber optic lasers, diffraction grating lenses, and holographic optical elements. A more advanced target ATP design is based on experience gained from holographic optics research and involvement with adaptive optics. Some of the advanced features are: 1) The tracker and alignment beam cameras are moved from the aft body to the vibration isolated forward body where the optical jitter is significantly reduced, 2) Coincident pupil plane alignment with the suspended body telescope center-of-rotation along with the center-of-mass which is adjusted using counter weights, 3) Unique High Energy Illuminator Laser (HEIL) beam combining optics to tracker optics through a shared aperture telescope, 4) Reactionless beam steering mirror design using momentum compensation, 5) Wide Field-of-View (WFOV) iso-planatic lens design to minimize tracker error due to off-axis field curvature aberrations and pincushion distortion, and 6) Removable reticle with folding mirror for boresight alignment referencing and calibration during operation. 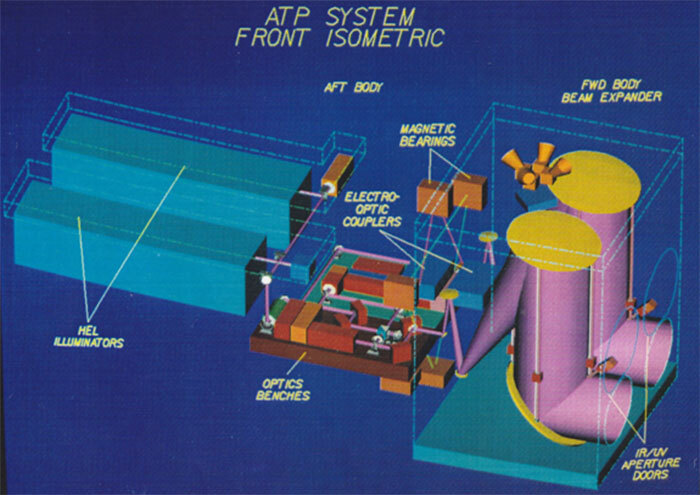 The isometric view shows the counterweights and gimbal relationship to the ATP telescope body. The gimbal pivot axis is coincident with forward body rotation center and the center-of-mass. The angular resolution of the gimbal is less than �0.5� which can be achieved with either a large number of stepper motor magnetic coils (about 36 per axis) or a DC motor drive with bearing friction compensator. A star tracker and rate gyro sensor is placed on top of the vibration isolated forward body that supports the telescope optics and tracker cameras. This design lends itself well for many ground based, space based, and aircraft mounted applications. The ATP design can also be used for high-speed communications. The initial approach is to use a low cost standard 630 mm diameter, f/4 focal ratio, and �1� FOV parabolic primary mirror in a modified Schmidt-Cassegrain optical telescope. The complete design can be modeled using AutoCAD using as many off-the-shelf components as possible. The most expensive component is the high energy short pulse illuminator laser at 4 joules/pulse and as much as 10 MHz pulse rate frequency at a 1.06 �m wavelength. The wavelength is a low atmospheric absorption window spectral bandwidth which provides for long range tracking of targets. I have applied my advanced holographic optics and image processing designs to alignment beam relay, wavefront sensing with feedback control correction, WFOV target tracking optics, camera optics, illuminator laser beam steering optics, and LOS direction sensor optics. Holographic optics provides displacement measurements that are smaller than the wavelength of light and methods of phase unwrapping provides for large angle measurement which covers the range of nano-radian tracking and pointing in the presence of degrees of angular displacement disturbance environments. Multiple stage vibration isolation, optical jitter suppression, and nested loop feedback control is required for high resolution tracking and precision pointing which provides an isolation dynamic range of 1x10-9 attenuation. My opto-mechanical designs reduce adaptive optics wavefront error by establishing stationary pupil relay optics over the DM (Deformable Mirror) as well as the wavefront sensor during tip-tilt LOS corrections. The DM is a MEMS (Micro Electro-Mechanical Systems) device with multiple piston actuators that conjugates the incident wavefront to produce a planar wavefront. Standard Shack-Hartmann wavefront sensors measure the gradient or wavefront tilt across the pupil of the beam. My BSM (Beam Steering Mirror) design tip-tilt stage aligns the pivot axes to the plane of the mirror which provides constant wavefront detector correlation to each DM actuator during tip-tilt excursions. The influence matrix between detectors and actuators is more accurate with my design due to the stationary pupil of the relay optics and the modified Stewart platform BSM mechanism. WFOV optics is required for severe vibration environments with a beam steering control to stabilize the beam on the DM. This design allows mounting a DM to a BSM tip-tilt stage for low order Zernike wavefront correction. The DM provides accurate high-order wavefront correction with less excursion at low spatial and temporal frequencies. My BSM mechanisms are modified Stewart platforms for optical jitter suppression and feature a tip-tilt pivot axis which is aligned to the plane of the mirror. Aligning the pivot axis to the plane of the mirror eliminates translation at the pupil plane and allows for a smaller lower mass moment of inertia mirror. A lower mass moment of inertia mirror provides higher temporal frequency bandwidth operation. A larger BSM device is designed for telescope optics vibration isolation and has a variable pivot axis point of rotation. The desired pivot axis point of rotation is located where the pupil plane of the telescope is coincident to the center-of-mass. My modified Stewart platforms feature a high speed inverse kinematics algorithm for wide bandwidth operation. The BSMs are reactionless and produce no reaction forces or moments to the supporting optical mount which further reduces vibration disturbances to the supporting structure and surrounding optical instruments. The advanced ATP design uses a modified Schmidt-Cassegrain telescope with parabolic PM (Primary Mirror) and hyperbolic SM (Secondary Mirror). The f/4 focal ratio is a compromise between optical performance and telescope length. The Schmidt wavefront plate provides correction for spherical aberrations with minor adjustment to the wavefront that allows wide FOV (Field-of-View) extension out to �0.5�. Wide FOV provides continuous tracking and pointing in a high vibration environment. The Schmidt wavefront corrector plate also protects the mirrored optical surfaces from environmental contamination. The focal point aft of the PM provides a stationary pupil on the Schmidt corrector plate and the BSM (Beam Steering Mirror) within the ATP optics. My modified Stewart platform (see "Scanning Mechanisms and Vibration Isolation Mechanisms" section) is used for 1) SM tip-tilt, focus and center, 2) telescope optics LOS (Line-of-Sight) pointing and vibration isolation, 3) tracking image stabilization and optical jitter suppression, 4) LOS stabilization to maximize HEL beam pointing energy deposition, and 5) Adaptive optics DM (Deformable Mirror) tip-tilt and piston stage control for first-order Zernike mode correction. This modified Schmidt-Cassegrain offers highest optical performance with wide FOV and low off-axis aberrations which reduces tracking and pointing error. AO (Adaptive Optics) for ATP systems beam forms the HEL (High Energy Laser) wavefront for maximum energy deposition onto a target. Typically, AO corrects atmospheric turbulence effects along the beam path. AO for astronomy improves the PSF (Point Spread Function) at the telescope as the scintillation effects are constantly corrected for a point source star. The AO system optically conjugates the cumulative effects of turbulence as the rays from the star propagate through the atmosphere. AO for retinal imaging is used to compensate the aberrations of the cornea and lens. Tip-tilt stages are used in AO DMs to correct for low-order Zernike modes since excursion at low spatial frequency is typically too high for the DM. The pivot geometry for a DM mounted to a tip-tilt stage is shown below. The DM (Deformable Mirror) is represented by the green crosses on the circular structure polar frame and the WFS (Wavefront Sensor) is represented by the red plus symbols on a rectilinear grid. If the pivot axis is aligned to the plane of the DM then an angular displacement produces no translation of the DM pupil across the WFS as shown in the left hand side figure. If the pivot axis is behind or in front of the DM then the pupil of the DM translates across the WFS as shown in the right hand side figure. DM translation due to the offset pivot axis produces a DM actuator to WFS detector relation error. My modified Stewart platform for BSMs (Beam Steering Mirrors) provides a tip-tilt stage with pivot axis at the plane of the DM which eliminates the error of pupil plane translation across the WFS detectors. My modified Stewart platform design reduces high-order wavefront error by placing the tip-tilt pivot axes along the plane of the DM. The number of WFS detectors is typically 2x the number of DM actuators which sets the spatial Nyquist frequency limit to the number of DM actuators. Typical feedback controllers for WFS output to DM input use the pseudo-inverse matrix for an over-determined or over-constrained set of linear equations and this configuration can produce excessive open loop error. My derived feedback control algorithm reduces WFS detector to DM actuator positional error during tip-tilt angular deflections by using a LSE (Least-Square Error) data decimation method along with detector to actuator pointers and arrays.